Zune player is a brand new portable media player from Microsoft that intends to penetrate the mass market of increasingly popular portable MP3 player, music player, video player or media player now dominated by Apple iPod. Zune features built-in 802.11b/g Wi-Fi connectivity, 30 GB hard disk, 3-inch 320×240 resolution QVGA LCD screen with ability to support 640×480 resolution for video-out playback, Radio Data System enabled FM receiver or tuner radio, movies, able to play music, songs, movies, videos and view pictures by supporting unprotected H.264, MP3, WMA, WMV, MPEG4, JPEG and AAC media playback, Podcast playback, automatic conversion to compatible format, upgradeable firmware, 3 day validity for Wi-Fi transferred songs from friends, XBOX streaming, WiFi transfer of photographs, and ability to create a “ZuneTag” which shared with other Zune users in the area nearby or scan and know what others is listening. Zune can play up to 14 hours battery life when playing music, 4 hours playing video or viewing pictures, with Wi-Fi off, or 13 hours playing music with WiFi on. Zune player measures 11.2 × 6.1 × 1.4 cm and weighs 283.5 gram, and comes with preloaded media contents plus exclusive online music store of Zune marketplace. Stereogum (link dead) sneaked peek at Zune pre-production model few months ago and concludes that Microsoft has introduced features to which Apple must, and will, respond. Wirelessly transferring tracks – be it device to device, device to computer, or device to music store – is a logical evolutionary step. Making personal pictures into wallpaper? Sure, why not, that too. But realistically, Zune has a few-months window within which to advance the possibilities their new technology offers; with aggressive marketing and smart management, there is hope for Zune to grow into the profitable, user-friendly community Microsoft envisions. But, as it stands, Apple has the image, the loyalty, and the market share. Junk Drawer reviews Zune after product demo few months back that for as cool as the Zune looks and runs on cursory inspection I don’t think it’ll inspire anyone to dump their Macs and run pell mell to the Windows platform vis-a-vis the iPod’s power inspiring the reverse. But guess what? Microsoft couldn’t care less about Mac users. They’re banking on selling Zune to the millions who don’t have an iPod yet, and those who only have one MP3 device in their life. Shudder to think! As for all the Mac purists out there, hopefully Zune will force Apple to step it up and push the iPod to new heights instead of resting on its laurels and throwing out more storage or new colors occasionally. Engadget has a hands on Zune and concludes with lots of photos gallery that the software seemed very responsive, especially search. As for the hardware, again, there isn’t much we can say at this point about the crippled functionality of the wireless, but if you haven’t already come to terms with what features the Zune is and isn’t launching with, then you might want to try and look at it for its merits as a player (while ignoring the wireless) — or simply keep looking for another device. CNet reviews Zune and concludes in its editors’ take that the Zune is a well-designed portable media device with good playback performance, a snappy processor, and an excellent interface. Wi-Fi sharing worked well, but prospective owners should know that its format support, especially for videos, is limited. The Zune looks like a good fit for MP3 player novices. ComputerWorld (link dead) concludes that Zune Marketplace isn’t nearly as advanced as iTunes or, for that matter, some of the other subscription services. Besides not offering videos, podcasts are unavailable, and, with just over 2 million tracks, it offers far less music than iPod’s 3.5 million. 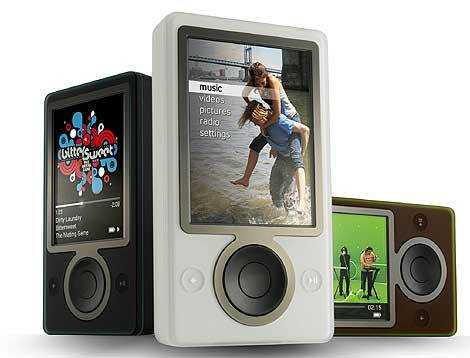 Zune has some strong, even compelling features but also many areas that are underwhelming. It is the beginning of a work in progress that will be attractive to some users now. But many users will find that it is not quite ready for prime time. PC World (link dead) takes a first look on Zune media player and concludes that Zune shows impressive polish for a first effort, but the Zune’s features don’t seem compelling enough to make it a serious threat to take a big chunk out of iPod sales. So far, the Zune looks like a solid addition to the MP3 player market. It’s a nice-looking player and appears to be a decent value. PC Magazine concludes with good rating of 3.5 out of 5 that tight software integration, a subscription plan, and slick design make the Zune an interesting, if not compelling, iPod alternative. Zune has nice design, easy-to use, three-inch screen, wireless music & photo sharing with other Zunes plus good integration with software. However, it has small hard drive, non-replaceable battery, weak Battery Life, no PlaysForSure support and no Podcasts or Video offering in Zune marketplace. Washington Post concludes that Zune’s relentlessly proprietary nature suggests Microsoft drew the wrong lessons from Apple: It matched the restrictiveness of the iTunes Store, not its utility. The Zune player itself is the most appealing part of the package. About the size of a deck of cards, it comes in dark gray, brown or white and provides almost 30 gigabytes of hard-drive storage. It has an intuitiveness absent from most other iPod rivals. Incompatibility with other Windows Media-based online music stores should provoke a lot more angst. Zune software and hardware only play “unprotected” MP3, AAC and WMA files, plus Zune Marketplace downloads. They ignore anything obtained before from stores using Microsoft’s formats. Rhapsody, Napster or MSN Music songs, audiobook loans from a library, Amazon Unbox video rentals–they’re all dead to the Zune. This is a breathtaking display of corporate faithlessness, cluelessness or both. Chicago Sun-Times (link dead) predicts that the Zune will be dead and gone within six months due to the facts that Zune is a complete, humiliating failure. Toshiba’s Gigabeat player, for example, is far more versatile, it has none of the Zune’s limitations, and Amazon sells the 30-gig model for 40 bucks less. Throw in the Zune’s tail-wagging relationship with music publishers, and it almost becomes important that you encourage people not to buy one. Companies such as Toshiba and Sandisk (with its wonderful Nano-like Sansa e200 series) compete effectively with the iPod by asking themselves, “What are the things that users want and Apple refuses to provide?” Microsoft’s colossal blunder was to knock the user out of that question and put the music industry in its place.